Hello fellow deskers and anyone else that happens to drop by! I'm sharing my workdesk for woyww (check the site for an abundance of crafty desks, all available for you to snoop around!) I am late posting this, but at least it's still Wednesday! The gloomy morning light is really not the best time to take photos... My space has been enlarged a bit, as I moved the old, unused computer away from the corner. 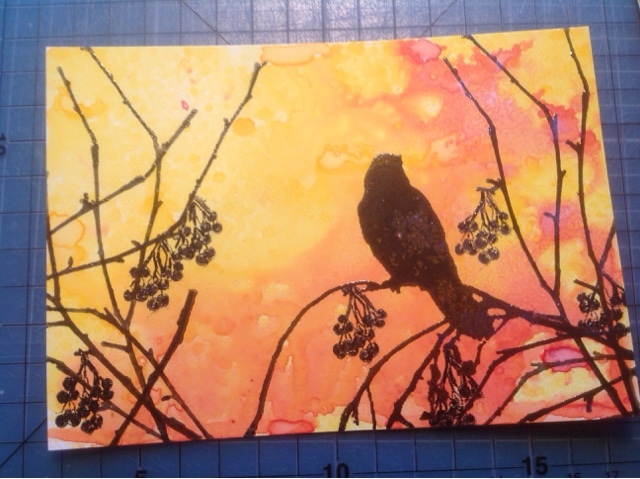 lovely calendar page, looks like the bird is watching the sunset. The berries don't bother me. I love the calendar page you made! The berries go well with it.